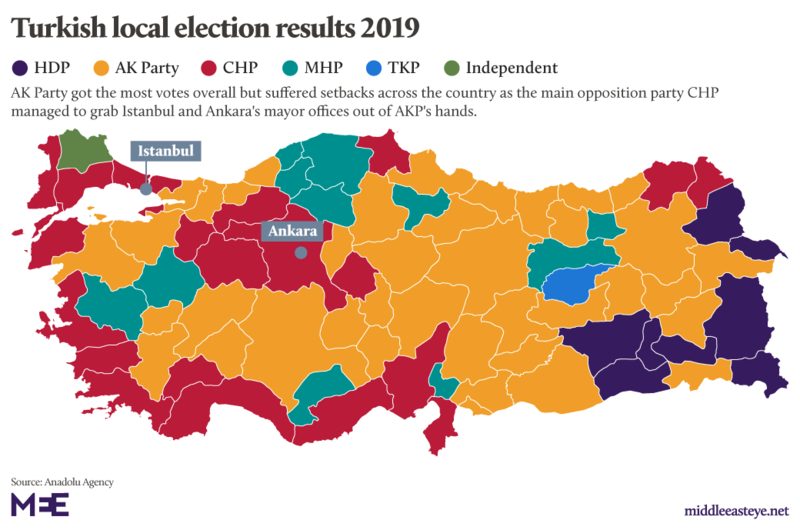 It's official, or maybe not quite — as perhaps predictably the AK party plans to challenge the stunning defeat: Erdogan’s party has lost Turkey's three largest cities, Istanbul, Ankara and Izmir, to the opposition Republican People’s Party, or CHP. Ballots in the crucial local election were completely tallied on Tuesday, and the upset represents a huge setback for the president and his party amid a continued bleak and worsening economic situation. The final results now with 100% of the ballots counted as reported by the semiofficial Anadolu news agency put opposition candidate for mayor of Istanbul, Ekrem Imamoglu, at 48.79%, barely inching out rival AKP candidate Binali Yildrim's 48.51%. And in the capital of Ankara, CHP's Mansur Yavas won with 50.93% of the vote, compared to AKP's Mehmet Ozhaseki's 47.12%. Some are servicing the ‘beginning of the end for Erdogan’ story again. AK Party won 44.3 % and the coalition won 51.6 % of the votes. Erdoğan has his mandate until 2023. No elections till then. Stop presenting your wishful thinking as fact and analysis. The AKP spokesman, Omer Celik, claimed early on Tuesday that there were significant voting tally discrepancies between polling and the actual vote — enough to cause AKP to lodge objections. The secularist CHP (Republican People's Party) condemned that move, accusing the Islamist-rooted AKP of trying to steal the result. Parts of the largely government-controlled media are reporting allegations that stolen ballots hindered the party's performance. The polls posed a major challenge for Erdogan, given a backdrop of high inflation and rising unemployment sparked by a major currency crisis last year. Earlier this month, official statistics showed that in the last two quarters of 2018, the Turkish economy slipped into its first recession in a decade, as inflation and interest rates soared due to the currency meltdown. In February, inflation stood at just under 20 percent, while the Central Bank's main interest rate is currently 24 percent. The head of that council, Sadi Guven, said in Ankara on Tuesday that it had shared preliminary results with political parties. For now, he said, the council will give certificates of election to candidates whose victories are not subject to appeals, which can be submitted until 3 p.m. Tuesday. The council will rule on those challenges within eight days, he added. Chaos erupted late on Sunday when President Erdogan's ruling AKP party was looking certain to lose control of the capital, Ankara, while both AKP and the opposition CHP party claimed victory in Istanbul in the culmination of a critical municipal vote that is testing the popularity of Turkey's executive president. As reported by various news wires, preliminary results showed the opposition flipping the capital Ankara and surrounding areas from Erdogan’s alliance, and taking control of some of Turkey's key Mediterranean coastal cities. In a stunning (or perhaps not, after all this is Turkey) to what appears to be an extreme close vote, even before the final figures were announced, Erdogan’s ally and former prime minister Binali Yildirim said he won the race in Istanbul, Turkey’s commercial hub, a claim rejected by the opposition, which said it won. When Yildirim declared victory, the state-run news agency reported a margin of less than 0.1 percentage point between him and his main rival Ekrem Imamoglu. That means that out of some 10 million ballots cast in the city, the difference was about 5,000 votes according to Bloomberg. 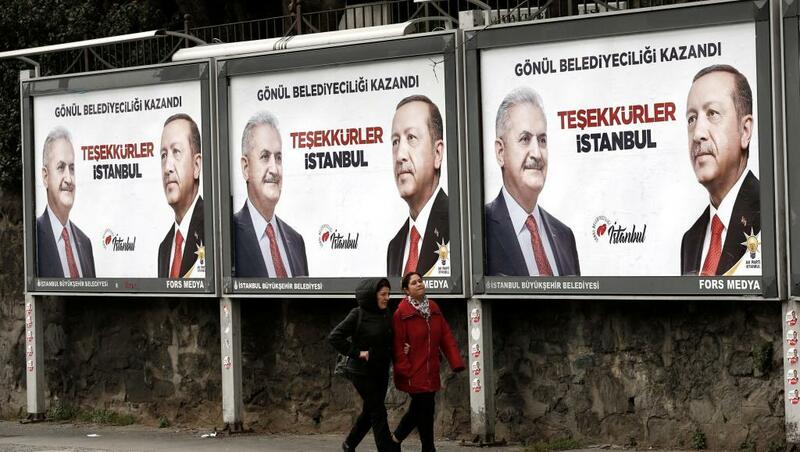 Adding to the confusion, and calls that Erdogan has stolen the election, when Yildirim spoke, the state-run news agency showed 98.8 percent of votes tallied, and then stopped reporting updated results for Istanbul after he declared victory. The opposition candidate said the result was manipulated and the party’s leader also claimed victory in televised remarks.